“You’re going to love this ride! The scenery is so amazing, you’ll wish you had a camera.” So after hearing that response from two of my friends as I told them I was riding in The Katie Ride for Life...I thought to myself, “Well, why not?” Thinking it would be so cool to share the sights of the day’s event from a riders point of view with people that aren’t able to be out there riding or maybe with ones that would like to consider doing it next year. So Saturday morning, April 16th, I’m sitting on my mountain bike (yes, a mountain bike) among the cyclists of our 160-member Mayo Clinic Team awaiting to start my first ever group bike ride. David Caples, the father of Katie Caples, who the ride is named after, gives us a countdown from ten just before the nearly 750 cyclists take off to either ride the 18, 36, 62 or 100-mile course. I chose the 36-mile course since it was my first time riding more than 9 miles at a time. Next up...Fort Clinch. 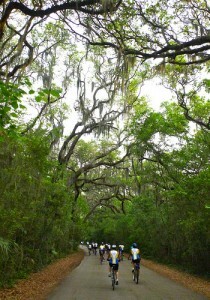 Riding through this state park meant seeing jungly palmetto bushes, Spanish moss and smiling pirates. It also happened to be the portion of the ride where I learned how to keep my pace while shooting photos and video. Two miles into the race, I thought to myself, “I can’t believe I’ve never been to Fort Clinch before. This place is absolutely beautiful and full of nature trails!” and then my chain falls off. Remember...this is still the learning phase. After putting the chain back on, the next 30 miles included riding through the gorgeous neighborhoods of Amelia Island, getting lost a few times, passing multiple golf courses, struggling over the windy Nassau Sound, drinking water from a pirate’s cup, meeting my Team Mayo Clinic riders and finishing a bike ride that made me feel so gratified. I just helped raise awareness of the importance of donating life. PS: In twitter speak, by putting this "#KatieRide" in a tweet, it allows all of tweets that are posted to twitter, to be categorized and linked together. You can see what I'm talking about here. I put it in the title of this post to show how social media was involved with The Katie Ride for Life.